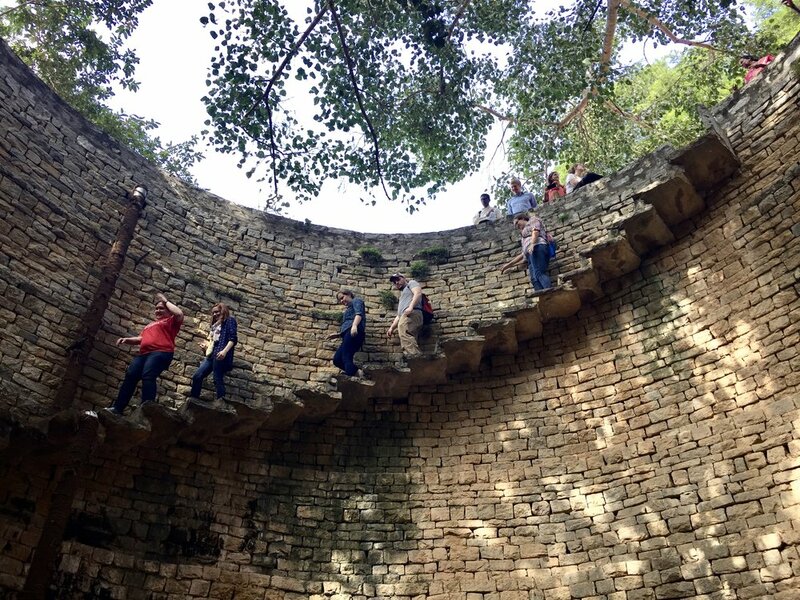 In the middle of your time at Columbia, all M.Div students are required to go on an immersion learning trip, either in the city of Atlanta, within the United States, or somewhere around the world. 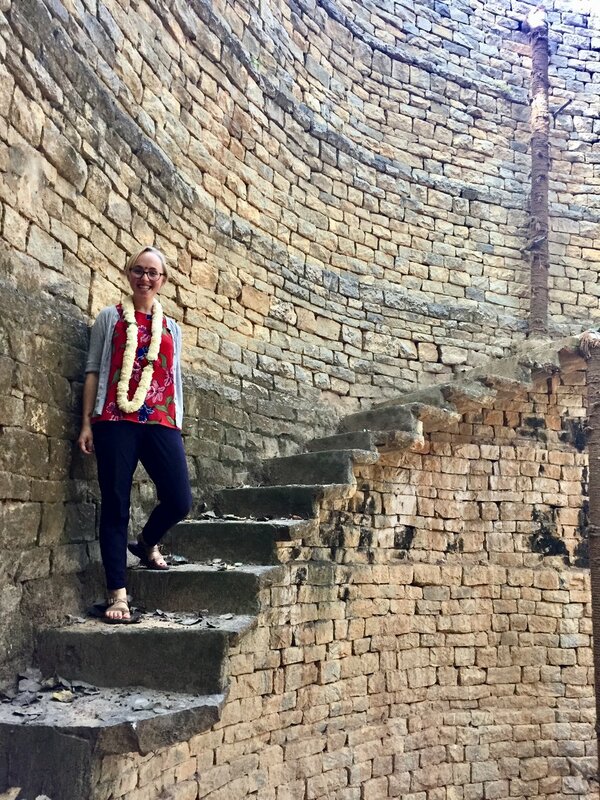 I was chosen for the trip to India, as one of 14 students and led by 3 faculty members. Above all, I am so grateful to this incredible group of peers and professors. I was constantly encouraged and challenged by each of them. We started our trip in the southernmost state of Kerala, where Christianity first came to India in the first century by St. Thomas. There, we visited Syrian Orthodox seminaries and churches, including a Mar Thoma church where we were invited to take communion, which was a huge honor. From Kerala, we flew across the peninsula to Chennai. From there, we drove over to two Hindu temples. 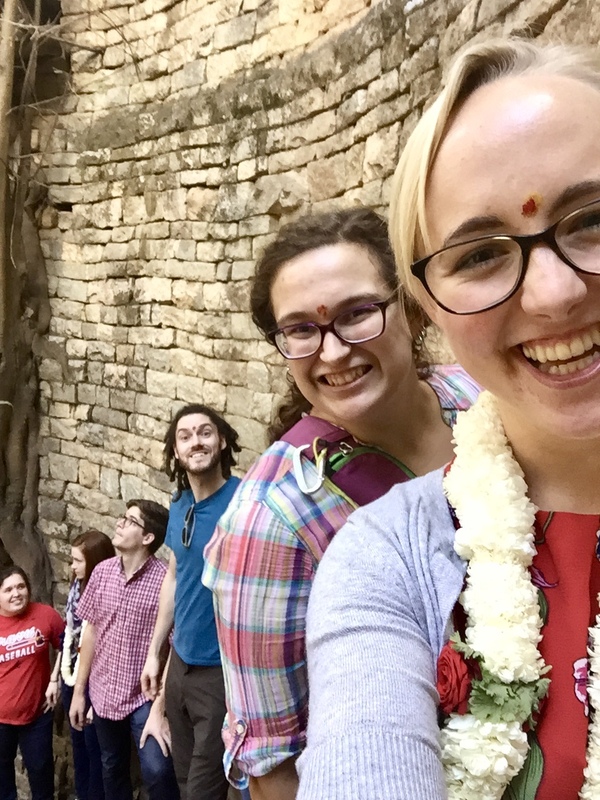 I had never been to a Hindu temple before and I had no idea what to expect. The first day, we went to Srikalahasteeswara temple in Srikalahasti. The temple is dedicated to the worship of Shiva, the Destroyer God. Shiva is a chaotic god, worshipped by primarily lower castes, and the temple reflects that chaotic nature. After removing our shoes and paying an extra fee for the “fast pass lane” we were ushered inside the large stone temple. In the hallway outside the main shrine, there were lines of worshippers waiting to watch the ceremony and to witness the revealing of Lord Shiva. A group of musicians started playing loud music of drums, trumpets, and singing. It was deafening. We were ushered into the main shrine, where the women were separated from the men and we all sat to watch the ceremony. The priests began with a food offering, then the waiving of lamps, chanting, and finally- the revealing of Shiva, a large, black phallic statue. We were brought forward to receive the light and holy water from the priests. The whole ritual was repeated again at the other part of the temple for the goddess Parvati. We weren’t allowed to take any photos in the temple and it forced me into the posture of a pilgrim. I had no choice but to experience everything that came way, even when I didn’t understand it. It was a huge honor to witness the ceremony and we all left in sensory overload. 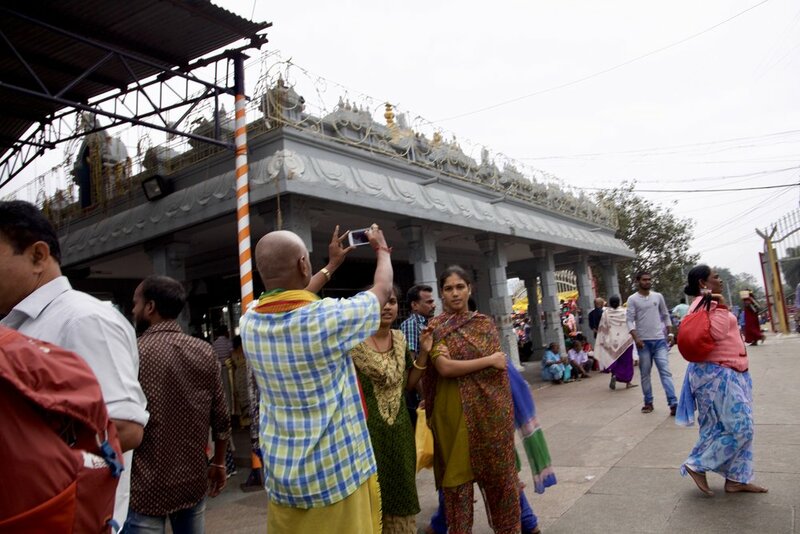 The next day, we headed to the Venkateswara temple in Tirupati, which is one of the most visited religious sites in the world, with over 29 million annual worshippers. It is the wealthiest religious site in the world! 30,000 people get their heads shaved there every day. This temple is dedicated to the god Vishnu, the Creator and Sustainer. He is primarily worshipped by the upper castes, and the temple mount reflects that. It’s a 10 sq. mi. 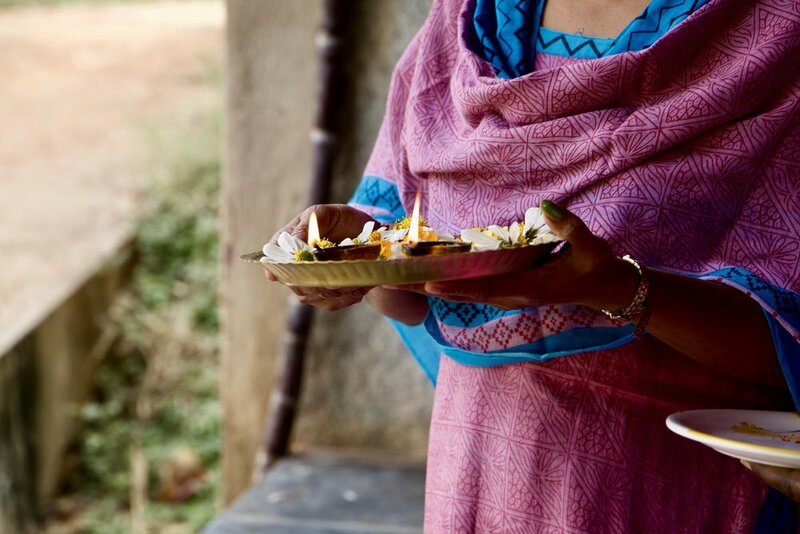 complex and gave new meaning to the term “temple worship.” There is a whole economy that exists on top of the mountain, from the lodging to the tonsures (head shavings) to the woman roaming around trying to charge a few rupees for a head painting. A film crew for a local news station happened to be there and was fascinated by our presence. Several of our group members got interviewed and later we found out we had been in a local newspaper/ tabloid due to our visit to Srikalahasti. The next day, we visited Pravaham- a school for poor, rural girls who cannot go further in the government school system. 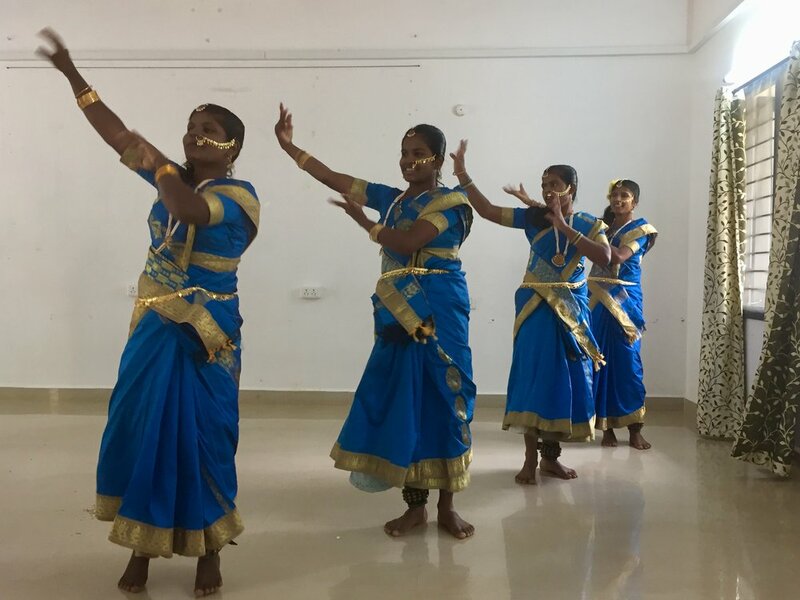 Pravaham is a residential school, giving them a stable learning environment and skills training to become nursing assistants. The girls were incredible and we were honored to not only hear some of their stories but to witness the joy of their transformation. They had prepared dances for their Christmas pageant last month and were so excited to perform them for us. The dances were beautiful and a huge treat for many of us since we had never seen traditional Indian dances before. When they finished, the music kept playing and to our surprise, they brought us up to dance with them. It turned into a huge dance party, with all of our group trying to learn the dances with them. My favorite moment was when one of their teachers came up to dance with them. The girls squealed loudly with joy and it was clear this was a special treat for them as well. This was one of dozens of moments of incredible hospitality. 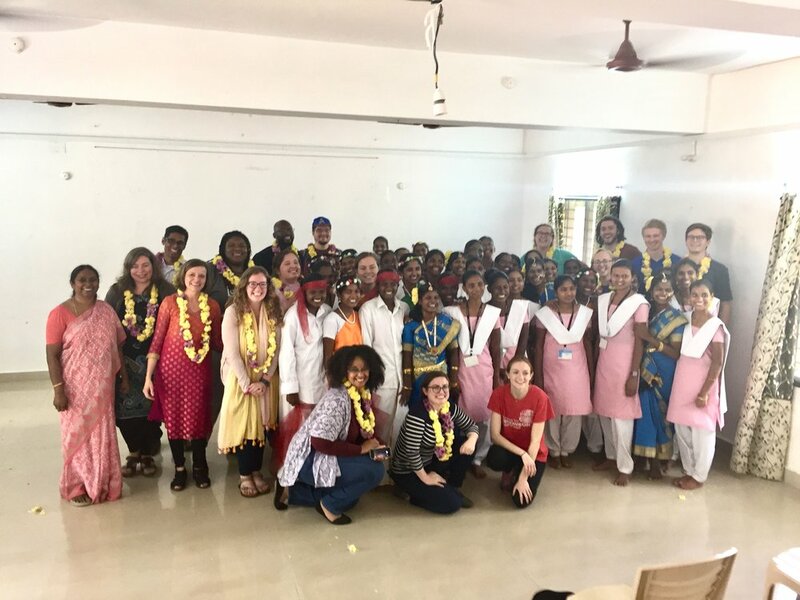 From daily tea breaks, to flower garlands, to a guest speaker traveling 6 hours each way to speak to us, the people we interacted with went above and beyond to extend hospitality to us. It certainly made me ask myself, do I show that kind of hospitality to others? 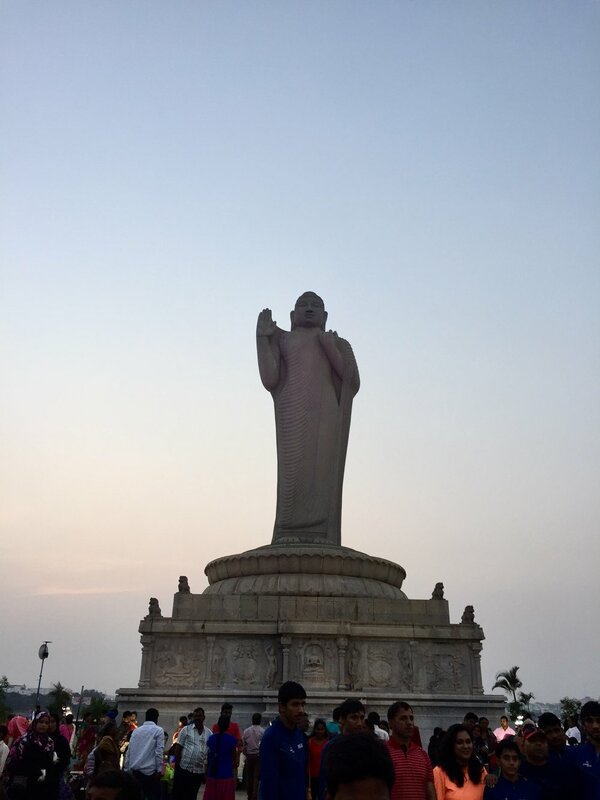 After our time in Andra Pradesh, we took a train to the neighboring state of Kanartaka and the city of Bangalore (which is once again called Bengaluru, after the British changed it). 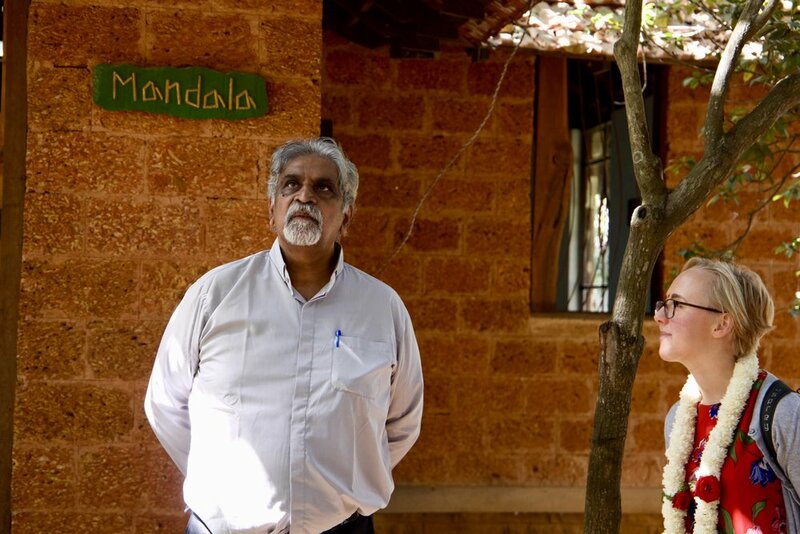 We spent two days at Visthar, an Academy of Peace and Eco-Justice. 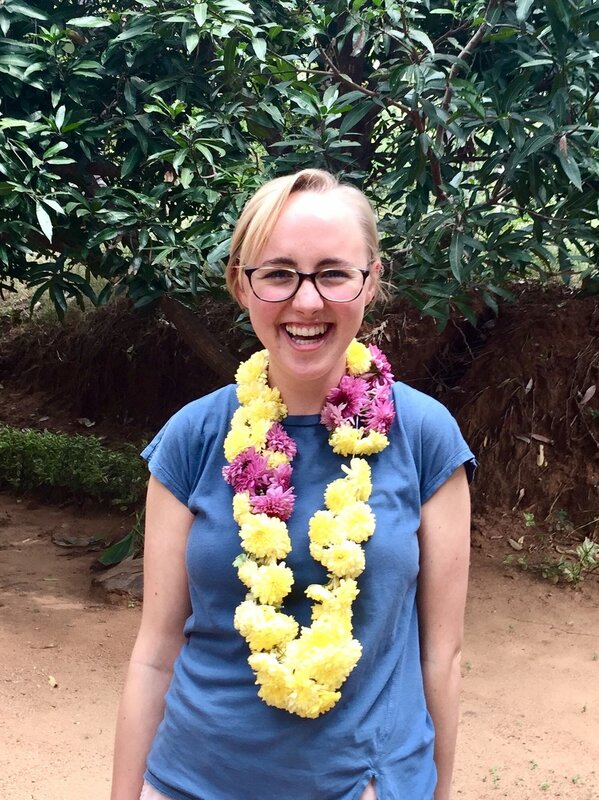 There, we were greeted with a ceremony of light and garlands and our foreheads were marked with turmeric and vermillion. At Visthar, we learned about issues of peace and justice in India. It was a powerful two days of learning, particularly about the Bhopal disaster of 1984, which I sadly had never heard of before. One of my favorite parts of Visthar was meeting one of the founders, Dr. David Selvaraj. David told us that the best he can hope for in life is “to reduce his hypocrisy.” That resonated deeply with me, as the voice inside my head tells me every day that I am, and will always be, problematic. As David would say, perhaps that is true. Rather than trying to pretend I can be perfect, I must do what I can to reduce the hypocrisy. That is the best I can aim for. While in Bengaluru, we stayed at United Theological College. We went to chapel at UTC one morning and I looked around and thought, “wow! They have a lot of international students from Southeast Asia here.” What I didn’t know was that these students are from Northeast India, a region of 8 states and 220 tribal languages and ethnic groups, connected by a small strip of land to mainland India. The people of this region have a very different ethnicity than mainland India, somewhat similar to bordering Bangladesh and Nepal. Frankly, before that day, I had no idea there was ethnic diversity in India, at least not like this. I had assumed Indian was an ethnicity, as well as a nationality (it’s not). At UTC, we had the opportunity to speak to several students and ask them questions about what it like to be tribal and Indian, how they are received by mainline Indians, and about what they hope for their region and country. It was an incredible learning experience for me and the students were so welcoming to us. I was captivated by everything I learned about Northeast India and hope I will be able to visit it someday. One of the most interesting questions we asked was about how people from mainland India receive them. 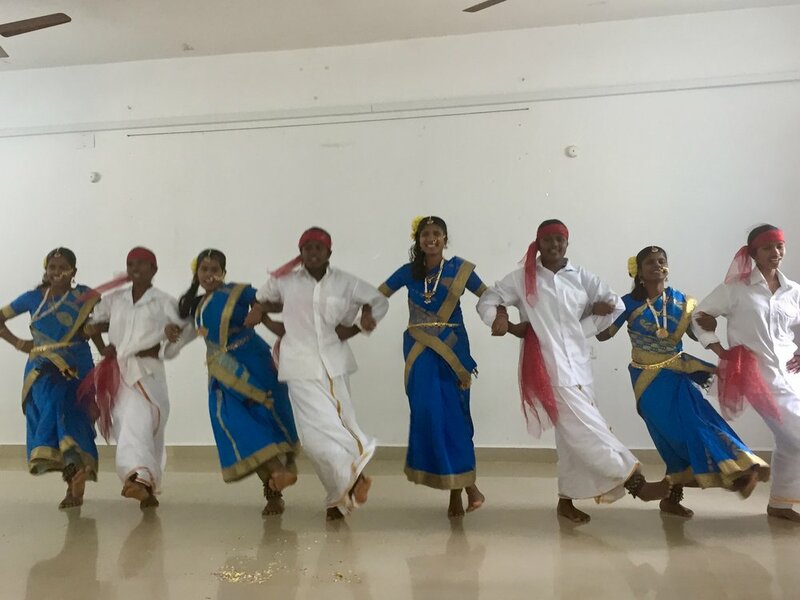 One of the students from South India explained that coming from the Syrian Orthodox tradition in Kerala means coming from a relatively high caste and place in society. If he were to tell his parents that he wanted to marry one of the tribal girls, they would initially be very upset because people from Northeast India exist outside the caste system, which in a way seems lower than where the Syrian Christians are in society. However, he said that his parents would become okay with it because the girls have light skin. They immediately agreed and said they experience a certain amount of privilege based on their skin color. This was just the tip of the iceberg of colorism in India. I knew that light skinned was privileged in India, but I didn’t realize the extent. The multi-billion dollar skin-whitening cream industry is just one of many symptoms of the Indian obsession with whiteness. Nothing encapsulated this more than the way our group was treated. Only twice did we see other groups of foreigners, so almost everywhere we went, we were the only foreigners in the area. To our surprise, people constantly came up to take selfies with us. People would shove their crying children up to me, just to get a picture with a foreigner. Sometimes they asked for our permission, but other times they just stood obviously at a distance taking a selfie with us in the background. The picture above was a common sight to us. It would have been an incredibly strange experience if that were the end of it. But of course, it wasn’t a universal experience. It was, by far, a very racialized experience. We had 3 African American students on the trip, and they had a very different experience with photo taking than the white students did. As you might expect, the blonder the hair, the more photos we were asked for. It put all of us in an uncomfortable situation. On one hand, I came to India wanting to experience their culture and this is what the culture is. Is it rude to say no? Should I say yes even when I’m uncomfortable? This custom was actively hurting our group members. Even if it’s just something as basic not getting asked for your picture taken, it’s a symbol of a much larger system that privileges people based on the color of their skin. It’s just a snapshot of the way that white supremacy permeates so many aspects of our lives. There was no easy solution to this problem and for the most part, I just uncomfortably said yes. When I was in college, one of my best friends went to Hyderabad to serve at an organization that works with the Dalit population. At the time, I remember thinking that Dalits were “untouchable” and oppressed in every way. I only had one story of what it meant to be Dalit. I had never thought to ask my Indian friends at Columbia what caste they were from and sadly it never occurred to me that Dalits could be something other than the marginalization I had imagined. What I found was marginalization, but also prosperity. Dalits are not just people living in slums, they are Seminary presidents, teachers, theologians, leaders, and my peers. I learned that there is a whole stream of Dalit liberation theology that I can learn from. Dalits in India are not just people that need my help, they are people that I can, and must, learn FROM. Even well-intentioned stereotypes fall short. This is one of many instances when my view of India shifted. More than once, I asked around, “what else don’t I know about India?” The answer could fill volumes, of course. Immersion learning is like nothing else. It's one thing to read about India, talk to my Indian friends, or eat delicious Indian food from Madras Mantra down the street. 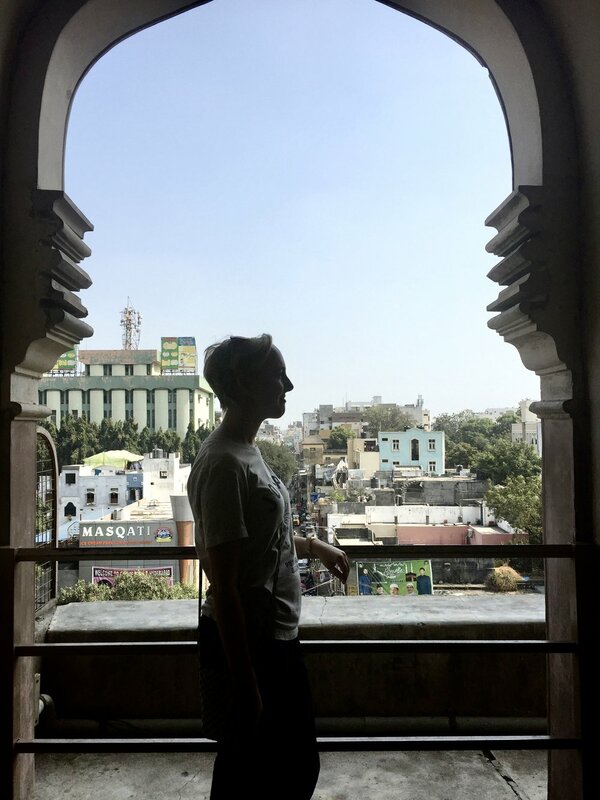 I tried to prepare myself and learn about the country I was about to visit, but after two weeks in India, my understanding of what it means to be Indian, my appreciation for all I have to learn, and my love for this part of the world have all grown deeper. Without the chance to put faces and scenery to match the names I had only read about, India was just words on a page. Now, India is full of color, texture, friends, and stories. Two weeks is hardly time to scratch the surface and I left filled with gratitude for the hospitality and kindness we were shown. Many photos on this post were taken by the wonderful Leslie Cox. Leslie, thank you for being our trip photographer!